In French, these are called Sous-Marin Nucléaire Lanceur d'Engins de Nouvelle Génération ("SNLE-NG, literally "Device-launching nuclear-powered submarine of the new generation"). They have replaced all of the Redoutable-class boats, with the last of those six boats being decommissioned in 2008. These submarines carry 16 Intermediate Range Ballistic Missile launching tubes apiece. This class reportedly produces approximately 1/1000 of the detectable noise of the Redoutable-class boats (submarines), and they are ten times more sensitive in detecting other submarines. Initially armed with the M45 Missile, they are designed to carry the new M51 missile, which entered active service in 2010. As of October 2010, an M51 has been test-fired from one of these submarines across the Atlantic Ocean from near France to the west, and is equipped on the Terrible. These boats were all constructed by the DCNS, and they carry an armament of 16 M45 SLBM or M51 SLBM missiles manufactured by the Aérospatiale company (now EADS Astrium Space Transportation. ), plus conventional torpedoes and Exocet anti-ship missiles. There have been four of these boats launched so far. On 3 February or 4 February 2009, the Triomphant (the lead class boat) apparently collided with the Royal Navy submarine HMS Vanguard. The Triomphant was reported to have proceeded to Brest under her own power, submerged, but with extensive damage to her sonar dome. For those who are looking for a pretty relaxing build after tacking something that has been difficult, you just cannot beat a modern submarine kit. This new Hobby Boss kit of the newest class of French boomers is quite typical. 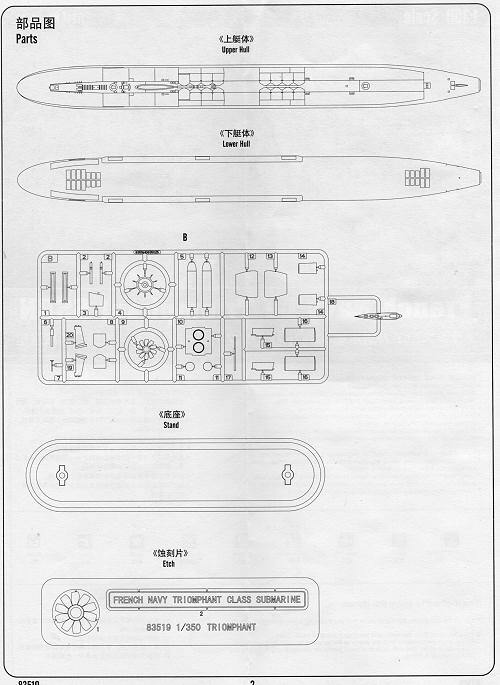 Parts count is pretty minimal as ship kits go, consisting of basically two hull halves with one only having to attach the sail structure and the rear steering and propulsion section. The kit does provide optional SLBM's and the ability to pose the forward missile hatches open, which is a nice touch. The rear end has the now standard shrouded prop and this prop is the only boat part that is done in photo etch. Even that is an option. The rest of the small photo etch fret is for the name plate. Since this is not a waterline kit, there is a nicely done stand. Instructions are well drawn with multiple paint company options. No decals on this one, which is a bit different, but will only help to speed up the build. Like all modern subs, matte black seems to be the color of choice. A full color painting guide is typical of Hobby Boss kits and included with this one as well. 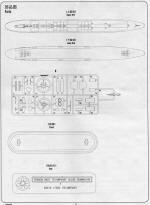 This adds to Hobby Boss' growing catalogue of modern submarines in this scale. I'm sure we will eventually see it in 1/700 as well, but even in this scale it is not huge with a length of about 15 inches. Highly recommended for a great wind-down kit and something the youngsters should be able to build with little trauma. Thanks to Squadron Products for the preview kit. Get yours today at your local shop or have them order it for you.